Home» AP GO's | AP LATEST UPDATES | AP MBBS Counseling for Admission into BDS Courses Rank wise Web Option Scheduled Certificate Verification Dates » AP MBBS Counseling for Admission into BDS Courses Rank wise Web Option Scheduled Certificate Verification Dates. AP MBBS Counseling for Admission into BDS Courses Rank wise Web Option Scheduled Certificate Verification Dates. AP Counseling for Admission into MBBS/BDS Courses Rank wise Web Option Scheduled Certificate Verification , Andhra Pradesh BDS Counseling-2016 Rank wise Counseling Web Option Steps Certificate Verification Dates , Andhra Pradesh MBBS Counseling for Admission into BDS Courses Rank wise Web Option Scheduled Certificate Verification Dates , AP MBBS Counseling for Admission into BDS academic year 2016-17 into the Andhra Pradesh Medical and Dental Colleges including Statewide colleges in the Andhra Pradesh State. Note : The eligible candidates are advised to attend for verification of Original Certificates at any one of the above Helpline centers of their choice. The Telangana Candidates those who are seeking admission in un-reserved (15%) and State wide quota seats have to attend Help line centers 1 and 4 (JNTUH,Hyderabad and NTRUHS, Vijayawada ) only as concerned officials of all the welfare departments of both the States will be available in Vijayawada and Hyderabad centers . Hall Ticket of Andhra Pradesh EAMCET -2016. 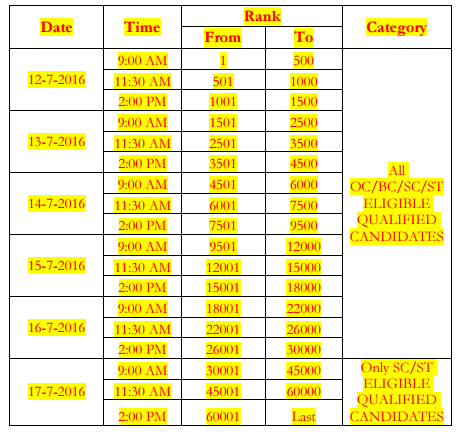 Rank card of Andhra Pradesh EAMCET -2016. Memorandum of marks of qualifying examination in Intermediate or Equivalent Examination. Study certificates from 6th Class to Intermediate. 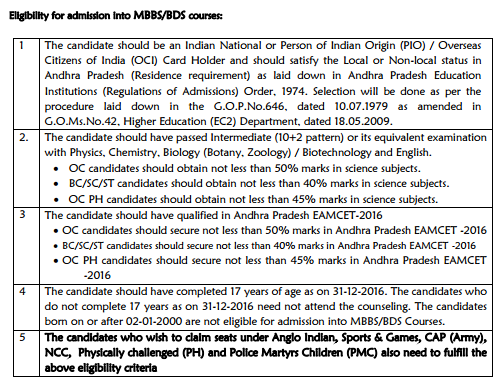 Candidates who have studied in the institutions outside of Andhra Pradesh have to submit 10 years (years of period to be specified) residence certificate of the candidate or either of the parent issued by MRO / Tahsildar. Permanent Caste Certificate (Integrated Community Certificate) claiming reservation under BC/SC/ST Categories issued by an Officer prescribed (a) Service records & SSC/ SSLC certificate of parent/ relative if parent is not in-service. The candidates claiming fee exemption shall produce the latest Income certificate of the Parent issued by MRO / Tahsildar. Get Download Counseling Instruction copy to Candidates Click Here. Get Download Undertaking Affidavity RS/-100 Click Here.